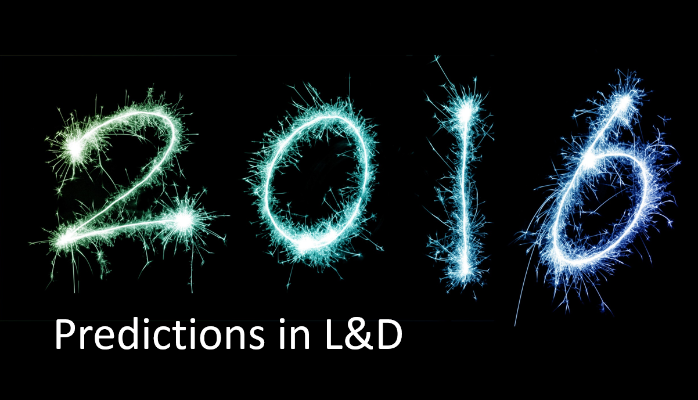 As we peer into our 2016 crystal ball, what might you expect to see? We’ll see more learners using mobile to learn. Not because the training is designed for mobile, but because the on-the-go learner will just use mobile anyway. Whether looking up a video, searching for a just-in-time solution, or trying to take a painful, mandatory eLearning course in the least painless way (albeit, perhaps distracted while taking it during their commute, watching their kids soccer game etc.). The latter is a sad truth and hopefully 2016 will see more courses designed in bite-sized learning and for mobile separately. Learners are responding to engaging, well designed videos, and I believe L&D professionals will thus design more. From the myriad of easy-to-use animation tools (GoAnimate, PowToons etc.) and even the built-in tools from Apple and Microsoft, I predict there will be a flood of new videos in L&D. Unfortunately, I predict that many of them will be awful as video will be used only for the purposes of engagement. Rather, video should be used to visually dramatize the content when other formats can’t do it justice. I’ll be looking for examples that adhere to the marketing principles used to create engaging TV commercials. Classroom training will be alive and well and will continue to thrive. Despite the influx of technological advancements, there is no substitute for the face to face experience. I sincerely hope the classroom time is maximized and thus short and 98% participatory with no lectures! Good classroom is priceless, but poorly executed classroom training gives the profession a bad name. I predict an increase in blended learning, or better said – Mixed Learning. It is more effective and efficient to use a mix of formats – eLearning, classroom, on-the-job, PDF resources, external videos, job aids. L&D needs to use the best formats to effectively have participants learn , without being limited to only using classroom with eLearning as pre-work. While I would love to predict more use of these efficient tools, I don’t think they will be used as effectively or as often as they should be in 2016. I believe there will be a slight increase in using interactive PDFs, mobile-friendly Job Aids (instead of mLearning courses), or using classroom/virtual classroom time to briefly outline how to use the job aid. How many times in your personal life have you looked up facts on Google or watched a video on YouTube to learn a skill? We don’t store facts in our brain anymore; we just need to know where to find the data. And Job Aids/Performance Support Tools hep with this. As an L&D industry though, we’re reluctant to lose the big training programs that our business partners are used to. Perhaps this is a trend for 2017? I predict more companies launching social learning programs but I do not foresee successful adoption. I believe more organizations will use social collaboration enterprise tools (e.g. Yammer, Jive) and free social connection tools (e.g. Facebook), in an effort to get employees to learn from each other. But I can foresee employees too busy to use it. The employees just don’t care about “learning” as much as L&D professionals do. Perhaps this is a trend for 2018 when we seamlessly package the solutions and the business owns social learning?